There are a lot of things to consider when choosing the right window for a home. Of course, aesthetics, shape and utility are critical in any window buying process. 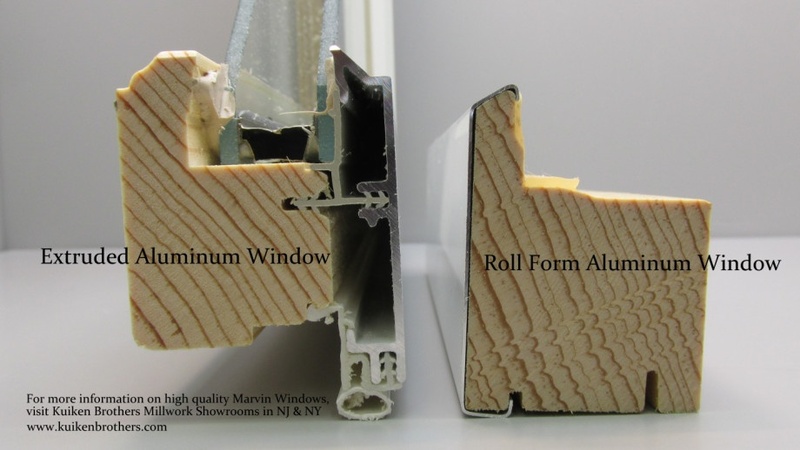 But, if we take a deeper look and consider the structural components of aluminum clad windows, we can begin to see some substantial differences that effect the overall durability and longevity of a product. For example, let's look at windows with an aluminum exterior. There are two main types of aluminum cladding that effect the overall performance and lifespan of a window. 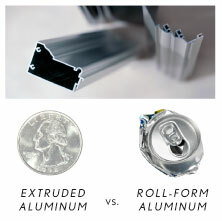 One type is what we call roll-form (coiled) aluminum. This cladding is easy to install, yet fails to perform in respects to durability and water protection. On the other side of the spectrum, we have something called extruded aluminum. This type of cladding is much thicker, lasts longer and guarantees little to no water damage over time. Windows that have roll-form or coiled clad, utilize aluminum that is essentially the width of a pop can. This aluminum is then, "rolled" against the sash, and positioned directly against the wood. The problem with this is, with roll-form, a narrow gap appears between the aluminum and the sash, that over time, allows water to seep in and rot the wood, due to minimal air circulation. Extruded aluminum, on the other hand, is about the thickness of a quarter and applied at somewhat of a distance from the sash. Marvin windows are known for using this type of clad because of its preventative design. Both the sash and the frame are made of extruded aluminum, allowing water to pool at the bottom and flow out. Also, because of the intended space between the sash and the cladding, air can easily ventilate that area and prevent the wood from becoming fully saturated. So, when choosing a window(s) for a home or commercial building, these structural components are essential. And, it's good to keep in mind that you can have it all; you can have the character, the beauty and the ease, without sacrificing the quality and longevity of the product. Where to buy exterior doors, Lowes, Menards or Home Depot?